Wait 15 minutes after the last alcoholic drink (alcohol takes about 15 minutes to commence absorption into your system) OR drink a glass of water before taking the test. Squeeze middle of the outer plastic tube between thumb and forefinger to break inner glass ampoule containing yellow crystals. SQUEEZE ONLY ONCE. DO NOT CRUSH OR BEND TUBE. Use tester immediately. Take a deep breath and blow, in one continuous breath, for 12 seconds through the end of the tube designated by an arrow. BLOW VERY HARD. EXHALE THROUGH TUBE, DO NOT INHALE. Shake tester to distribute crystals evenly, wait two minutes. Identify any color change amongst a majority of the crystals. Crystals in the .02% tester will become white or ash at an alcohol level of .02% or greater. The .04, .08, and .10% testers will develop a greenish cast at an intermediate level of alcohol; a bluish cast indicates levels at or above the designated level for the tester. For best results compare to unused tester. The BreathScan ® Alcohol Detector is available in several configurations. Check each Breathscan ® tester for its precise configuration, which is indicated by a specific percentage (e.g., .02%, .04% etc.) On the left side of the tester always check the legal limit for intoxication in your state. Note: Accuracy of test results may not be reliable if test is not conducted according to instructions. Refrain from driving after drinking. Do not drive at all if any crystals change color. If ingested, induce vomiting and contact physician. 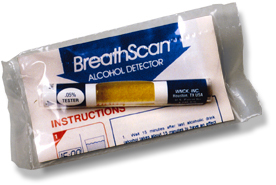 BreathScan® brand detector is a disposable breath alcohol indicator designed for one time use. The BreathScan® detector contains indicator chemistry which will undergo a color change in the presence of alcohol contained in the breath of the subject. 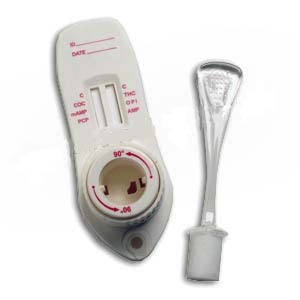 This product provides a reliable indication of alcohol present In the exhaled breath of the test subject when the instructions for use of the BreathScan® indicator are rigidly followed The manufacturers, suppliers, agents, distributors and retailers make no warranty, expressed or implied. as to the ability of this device to determine of detect intoxication of the subject, or to accurately indicate the subject's, blood alcohol level. Decisions and/or actions based on the use of this product by any person shall be at such person's own risk. The manufacturers, suppliers, agents, distributors and retailers assume no responsibility for consequences of subjects who test negative using this device but who later show that they are under the influence of or their judgment has been impaired by alcohol. WARNIING. . This product should be used only as a screening device and is only an Indication of the possible presence of alcohol in the blood of the test subject. Correlation between breath alcohol content and blood alcohol content depends on many variables, Including altitude. The exact concentration of alcohol In the blood of the test subject cannot be accurately determined by using this device. This device is not Intended to legally determine blood alcohol presence or level. No Inference of Intoxication is to be made from a positive indication. BreathScan® Is guaranteed to be free from manufacturer's defects. This warranty is expressly made In lieu of any and all other warranties expressed or Implied Including the warranties of merchantability and fitness for a particular purpose or use. There are no warranties expressed beyond the description of the product contained on this package. The warrantor expressly disclaims liability for incidental, special, or consequential damages of any nature. Use Immediately after breaking glass Vessel. Do not use if glass vessel! containing crystals is ruptured prematurely or if crystals are not yellow. If ingested, Induce vomiting and contact your physician.